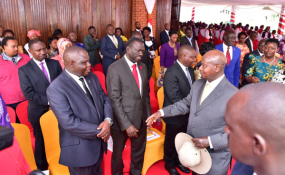 President Yoweri Museveni meets opposition politician Kizza Besigye (with red tie) and other officials at the Anglican martyrs shrine in Namugongo (file photo). Kampala — With barely hours left to the delivery of the landmark judgment in the presidential age limit petition at Mbale High Court, the Judiciary has issued guidelines on how the process will be effectively handled. Speaking to Daily Monitor on Tuesday, the Judiciary's senior communications officer, Mr Solomon Muyita, said because of the anxiety that has come along with the judgment, the court expects a big turn up of people at its premises, adding that mechanisms have been put in place to curb any disruptions and chaos. Mr Muyita said in a meeting presided over by Deputy Chief Justice Alfonse Owiny-Dollo on Monday, it was agreed that the main court room where the judgment will be read will have very limited access of litigants. He said only the five petitioners, their lawyers, a small number of diplomats and media will be allowed access. The courtroom adjacent to the main one will have giant screens to televise the reading of the verdict. Mr Muyita said this courtroom will accommodate Members of Parliament, a section of the media, local politicians and VIPs while the general public will follow the proceedings from the court's car parking lot where tents will be erected with giant screens and loud speakers. "We are also going to allow the major television stations to broadcast the reading of the judgment live. Our appeal to the general public is for them to remain in the comfort of their homes or work places and watch instead of scrambling for space at court," Mr Muyita said. "We also expect heightened security presence at Mbale High Court to keep law and order," he added. Mr Muyita also said shortly after the reading of the judgment, copies of the same will be given to the petitioners and their lawyers and media.